Casablanca’s Midparc economic zone is one of many in Morocco dedicated to aerospace and other up-and-coming industries. Its Free Zone calls itself an extension of similar facilities that already support Boeing, Dassault, Airbus, Safran, and others. OEMs and other manufacturers are finding opportunity in Morocco, and the Moroccan Investment Development Agency (AMDI, Hall 3 3510) is attending the Farnborough Airshow to highlight the region's advantages. Morocco has proved adept at selling the idea that its inexpensive labor pool can serve as an incentive to multinationals, with China, the U.S., and Canada among the nations to have benefitted. The aviation sector is now thought to amount to around 200 companies devoted to manufacturing ancillary and spare parts. Morocco’s push for international investment in its aerospace sector may serve as a template for emerging nations seeking to develop domestic jobs and industry. “Due to its political stability, solid infrastructure, and strategic location, Morocco is rapidly becoming a regional manufacturing and export base for international companies,” The Aerospace Industry in Morocco, published by AMDI in May 2017, said. “The Kingdom of Morocco is a dedicated industrial partner. The Boeing Eco-System is indicative of our ability to plan and execute large-scale projects in the aerospace sector and launches a new era of aerospace in Morocco,” Moulay Hafid Elalamy, Minister of Industry, Trade, Investment and Digital Economy, told the publication. Since beginning its participation at Farnborough in 2010, Morocco has seen rapid growth of its aeronautical sector. Official figures through 2016 said the industry had seen export sales and employees grow tenfold, to $1 billion and 12,000, respectively; the number of companies grow twelvefold to 120, all since 2001; and revenue growth rise 17 percent per year, on average, since 2009. The development of economic zones devoted to aerospace and other nascent industries has proved important in providing a platform for the growth of Morocco’s growing aviation-related sector. These include Aéropole Nouaceur in Casablanca, and free zones Midparc, in the same location, as well as facilities in Tangier, Kenitra, Oudja, and Salé, all of which host aerospace players. 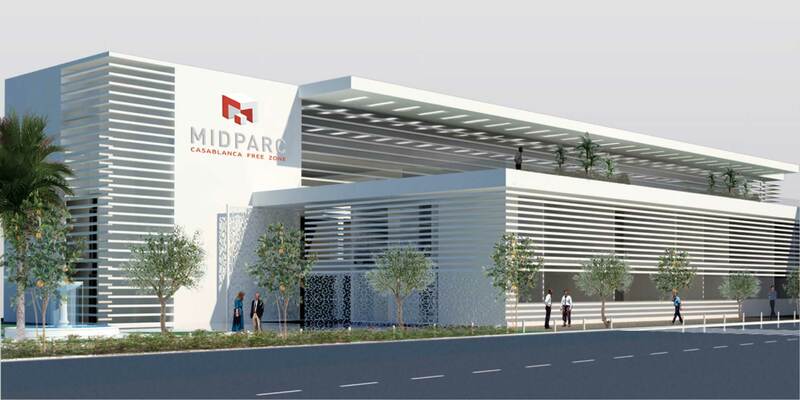 The Midparc Casablanca Free Zone claims to be an extension of the Casablanca aviation industries zone that already hosts companies such as Boeing, Dassault Aviation, EADS Aviation, Ratier Figeac, Safran, and others. Information on Midparc’s website claims that Morocco is a "competitive platform" for export, with monthly wages as low as $327 per month, compared to $338 in Tunisia, $430 in Turkey and $1,280 in South Africa. Its website said the local monthly wage was “almost 10 times lower than in Spain.” Government support of up to $5,600 a year per person can be provided for training new engineers, technical, and managerial staff at the zone, in the fields of aerospace and electronics. The government announced in 2017 it would develop, along with the Chinese MRO specialist Haite Group and the local BMCE Bank, the Mohammed VI Tangier Tech City, an economic hub able to generate 100,000 jobs, at least 90,000 of them guaranteed for the inhabitants of the often neglected Tangier region. The 2,000-hectare project involved an initial investment of $1 billion. “It will involve the arrival of 200 Chinese companies operating in a variety of areas including the manufacturing of cars, the aeronautics industry, aviation replacement parts, electronic information, textiles, the manufacturing of machines, and many more. Total investment by companies in the zone after 10 years is expected to reach $10 billion,” the AMDI said in April 2017. A recent briefing by the U.S.’s export.gov said Morocco is a central base in the region with high-quality facilities and more than 110 international aeronautical and aerospace companies operating in the kingdom. “Morocco boasts nearly 11,500 aviation professionals, of whom 50 percent are women. [Morocco’s] aerospace industry…plans to double its capacity and number of operators and create 23,000 new jobs by 2020. The Casablanca Free Zone in Nouaceur…is a designated industrial integrated platform with special support for investors in the aerospace sector,” it said. In late 2017, Boeing and RAM announced orders for four 787-9 Dreamliners, worth $1.1 billion at list prices. RAM's fleet consists of 737s, 767-300ERs, 787s, and a 747-400. A Bombardier manufacturing facility producing aircraft structures including flight controls for the CRJ Series aircraft is also located in Nouaceur. Construction of the permanent 13,935-sq-m facility by Bombardier at Nouaceur began in September 2013. “Our long-term future in Morocco looks well established, as does the future of our employees. Continuing development of our local supply base is a key factor of our success,” Stephen Orr, vice president, Operation Morocco Manufacturing, told AIN. Scheduled to be implemented in phases starting in 2013, Bombardier’s Moroccan facility today produces wing components, slats, ailerons, winglets, flaps, fuselage parts, fuselages, nose extensions, doors, floors, nacelles, and subassemblies for various programs of regional aircraft and business jets, a Bombardier spokeswoman based in Morocco told AIN.